My take: The Tuscan Child is the story of two families who never would have met if not for WWII. Lord Hugo Langley’s plane was shot down over a tiny town in Tuscany. He was eventually discovered by a young woman from the town, Sophia Bartoli. The story unfolds in a dual-timeline told from the perspectives of Lord Hugo and his daughter Joanna. I thought that worked well in the development of the plot. I liked the story well enough but I didn’t feel connected to the characters until the last few chapters. That could all be on me though so don’t let that dissuade you from reading the book. The descriptions of Tuscany and the food especially are lovely. The mystery involving Lord Hugo and Sophia was interesting and all seemed to be solved at the end. I think readers who like the era of WWII in Italy and a story of survival against all odds will find The Tuscan Child an interesting novel. Rhys Bowen is the New York Times bestselling author of over thirty mystery novels. Her work includes In Farleigh Field, a standalone novel of World War II; the Molly Murphy mysteries, set in 1900s New York City; the Royal Spyness novels, featuring a minor royal in 1930s England; and the Constable Evans mysteries about a police constable in contemporary Wales. Rhys’s works have won multiple Agatha, Anthony, and MacAvity awards. Her books have been translated into many languages, and she has fans from around the world, including the 12,000 who visit her Facebook page daily. She is a transplanted Brit who now divides her time between California and Arizona. Connect with her at rhysbowen.com. Description: World War II comes to Farleigh Place, the ancestral home of Lord Westerham and his five daughters, when a soldier with a failed parachute falls to his death on the estate. After his uniform and possessions raise suspicions, MI5 operative and family friend Ben Cresswell is covertly tasked with determining if the man is a German spy. The assignment also offers Ben the chance to be near Lord Westerham’s middle daughter, Pamela, whom he furtively loves. But Pamela has her own secret: she has taken a job at Bletchley Park, the British code-breaking facility. My take: I’m a fan of historical fiction so I was pleased to receive a review copy of In Farleigh Field from the publisher. It involves the aristocracy, WWII, and spies! During this time most of Britain wanted to help the cause in any way they could. Pamela, one of Lord Westerham’s daughters, and a very bright young woman, works her way into Bletchley Park‘s code-breakers. After a while she’s asked to do even more sophisticated work for her country. For security reasons no one can talk to anyone else about what they’re doing so she’s surprised when one of her oldest and dearest friends becomes involved in her latest assignment. This assignment will have them questioning their relationship as well as some of their closest friends and family. Can one truly trust anyone else at times like these? They will find out. I thought Bowen’s mystery was entertaining and it kept me turning the pages wondering who was intending to kill the most important British leaders of the day. There were so many possibilities and I was glad I didn’t know until the reveal. I liked the balance between light moments and more intense ones as the story played out. I wouldn’t label it a cozy but it wasn’t an all-out thriller either. I’ll have to say somewhere in the middle. At any rate, I’m glad I had the chance to read it. About: The setting is England, 1932. Lady Victoria Georgiana Charlotte Eugenie (Georgie to her friends) is 34th in line to the throne and her family money is gone. She needs a job – something unheard of in her circle. She heads to London to look for a job. During this time she stays at her family’s house. One day a man arrives with a note that says her family’s ancestral home in Scotland is his – the result of a gambling loss by Georgie’s father. A few days later that man turns up dead – in the overflowing bathtub of Georgie’s London house. The prime suspect: Georgie’s brother, the duke. Knowing it can’t be Binky (her brother), Georgie makes it her responsibility to find the real murderer. 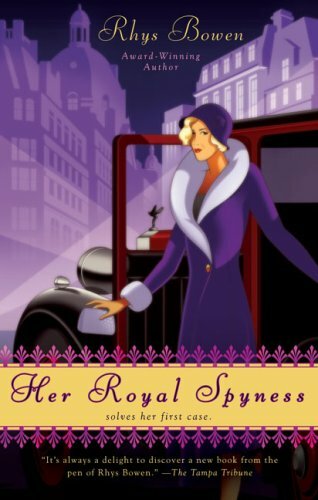 My take: I was asked to read and review the latest in the Her Royal Spyness series so, not being familiar with it, I decided to read the first book. Even better, I decided to use my September Audible.com credit to listen to the first book. I’m so glad I did because Katherine Kellgren’s performance is delightful. Rhys Bowen’s mystery of who killed the man in Georgie’s brother’s house is filled with amusing characters such as Georgie’s mother and her old school pal Belinda. There’s a flirtation between Georgie and Darcy O’Mara (an Irishman with a knack for showing up when she needs him) that I just know will be present throughout the series. 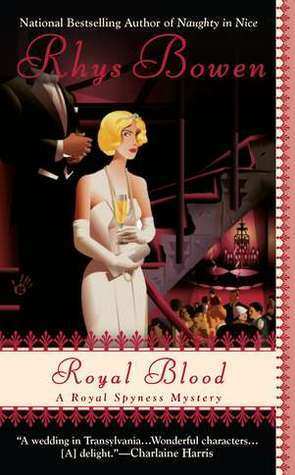 I enjoyed Her Royal Spyness and look forward to reading more of this series. Recommended to fans of cozy mysteries. If you like audiobooks I suggest you try listening to this book. My take: This was such a fun mystery. The author takes us from foggy London to snowy Transylvania via car, ship and train. Lady Georgiana (34th in line to the throne) is a charming character who finds herself representing the royal family at the wedding of distant relatives where she winds up being a suspect in a murder at the castle. Royal Blood had the feel of an Agatha Christie mystery. There were several possible suspects and just when I thought I had it figured out another possibility would pop up – along with another dead body! Rhys Bowen has a new fan in me. I love the settings, her entertaining characters, and the situations they find themselves in. This is the second book I’ve read by Bowen and I’m very pleased to know she has an immense backlist. Recommended to fans of Rhys Bowen and cozy British mysteries.